A World Heritage Site and the beating heart of the Industrial Revolution, Ironbridge is home to 10 amazing museums that make unforgettable days out. Travel back to the age of steam and experience the sights, sounds and smells of the Victorian era at Blists Hill Victorian Town. Discover how Coalbrookdale changed the world at the Museum of Iron; explore the artistry and craft behind the tiles that decorated Victorian Britain at Jackfield Tile Museum and browse the beautiful collections at Coalport China Museum. Across the year, groups can enjoy a series of special events at the museums. Check http://www.ironbridge.org.uk and see what's going on. 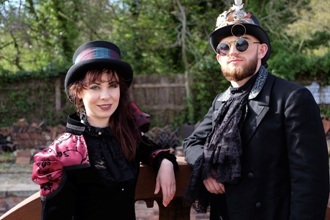 Special events include the second Steampunk Weekend, 23 - 24 June and the Steam Weekend 18 - 19 August at Blists Hill Victorian Town. Halloween will take centre stage during Ghostly Gaslight on 27 October. Then its fireworks night and the two festive weekends, 8 - 9 and 15 - 16 December, where groups can experience the magic of a traditional Victorian Christmas and take advantage of a very special rate at just £9.50 per person for pre-booked parties of 15 or more. Discounts are available for groups of 15 plus. There is free coach parking or a drop off facility at each museum; group leaders and coach drivers are entitled to complimentary admission when accompanying a group and coach drivers will be given a free refreshment voucher. Call the Group Visits Officer Ben Walker to discuss the options on Tel: 01952 435 900 or email ; details can also be found on http://www.ironbridge.org.uk.